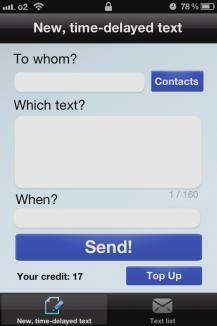 Text Bot lets you send time-delayed text messages. Who doesn't know this - You want to tell your friend something extremely important, but you don't want to ring him out of bed in the middle of the night! 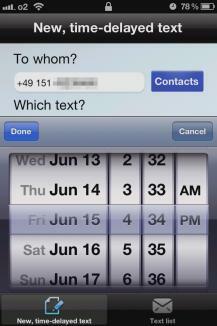 For that purpose we've developed Text Bot, which lets you enter the day and time you want to have your message sent. You'll never forget to gratulate somebody to their birthday or sending your girlfriend a compliment every now and then. Just enter a few nice words today, like "I was just thinking about you. 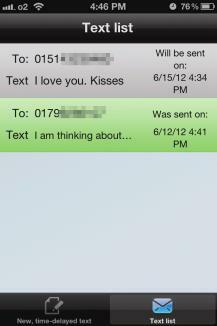 :)" and tell the app to send the message in 10 days, when you're in the middle of an important meeting. You also finally have the possibility to sleep in, while Text Bot tells your boss, that "I'm so sick, I'll probably not be able to make it into work today." - Text Bot will tell your boss automatically, early in the morning, when you're not even thinking about getting out of bed.